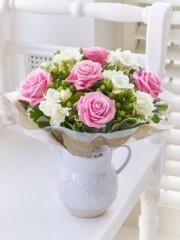 To celebrate the joyous occasion of a new born baby girl’s safe arrival, Edinburgh flowers have a stunning selection of floral arrangements and bouquets on offer. The difference between a bouquet and an arrangement is that an arrangement comes in either a lovely vase; a sharp box which contrasts and highlights the vibrancy of the flowers; a charming basket or even in a cute teacup depending on what sort of finish you’re after. A bouquet is arranged and then wrapped up in complementary tissues and papers with pretty ribbons tied around the loose stems so the flowers keep the formation. 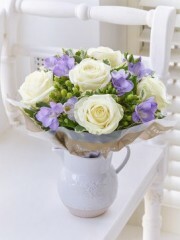 There is also the hand-tied bouquet which comes with a cellophane bubble of water which keeps the flowers hydrated - this type of bouquet is quite convenient as it doesn’t require to be put in water. All the flowers the Edinburgh florists work with are of the best quality as they have been imported directly to the shop all the way from Holland. Holland is a region of the Netherlands renowned for the premium quality flowers cultivated there so you can be rest assured in the knowledge that you recipient won’t receive anything short of perfection. 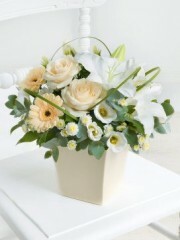 Up on the Edinburgh flowers website, you are able to browse through the arrangements the florists have already crafted to see if anything catches your eye. 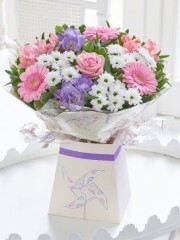 The baby girl flower collection features lovely tones of pinks, creams and lilacs. The Dutch cultivators provide the Edinburgh florists with a huge selection of flowers including delicate roses; germini; elegant lilies including those of the asiatic variety as well as lush foliage such as pittos and eucalyptus leaves and fillers like gyp and wax flowers. 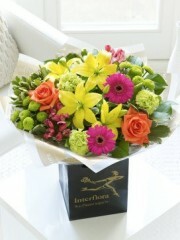 Edinburgh flowers want nothing more other than to accommodate to the needs and individual tastes of all our customers. 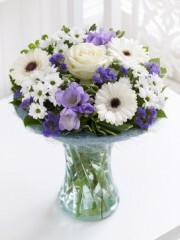 There is a bespoke service available at Edinburgh flowers if you don’t find anything that is fully to your tastes. 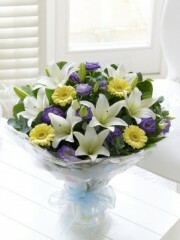 Through this service you are able to work in collaboration with the Edinburgh florists. This service allows you to specify what flowers should be used; what flowers should be avoided; any colour preferences asides from pink - perhaps yellow or cream; what sort of finish you’d like. 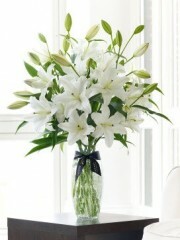 Once the Edinburgh florists have all of these details they require, they will turn your ideas into a reality. In addition to flowers, Edinburgh flowers also have a lovely selection of gifts on offer which are perfect for celebrating such an occasion. 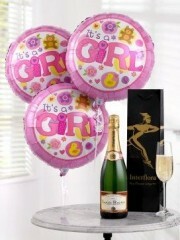 This gifts range includes a selection of champagnes and wines - including red, rose and white. Both these beverages are widely considered to be celebratory drinks which, in this case, can be enjoyed by the family and friends of the new born baby girl and her family. For the baby girl herself, Edinburgh flowers have a lovely range of teddy bears on offer which all vary in size and will serve to be a lovely source of comfort for the child as well as balloons. 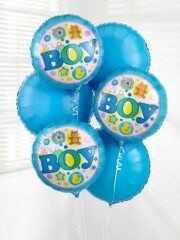 The Edinburgh florists are able to arrange charming balloon bouquets which usually consist of three blank balloons and three with a fitting message for this occasion such as ‘Congratulations!’. If you have any further queries about the bespoke service or any of the other services provided by Edinburgh flowers, please do not hesitate to get in touch. 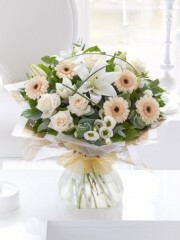 You are able to reach the shop either by email or phone as there is always a member of the Edinburgh flowers team available to answer any and all of your questions. 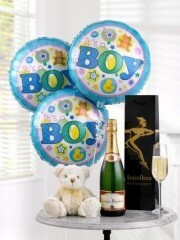 Four Seasons Florist Edinburgh has created a whole range dedicated to New Born Babies. We all know how wonderfully exciting it can be when a new life is brought in to the world and that is why our experienced staff have put in a huge amount of effort to bring to you our very first Baby range. A large bouquet of flowers is just what the Doctor ordered for a Mother that has given birth, a beautiful fresh scent can help you to relax. When choosing colours for your flowers, it is best to reflect upon the gender of the baby and use that to assist in your decision making; Pink for a Girl and Blue for a Boy. It is also important to think about the child as well, why not add to your flowers and make it gift set by including one of our teddies, letting he/she know that there are already so many people that love and care about them. If you think Mummy and Daddy need to be pampered a little more, then take a look at our luxury gift sets that include some of our most exquisite Champagne and chocolates and leave them feeling indulged and re-charged. 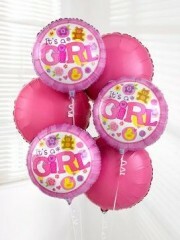 A common gift to send is our balloon bouquets. 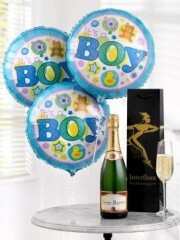 Often used to celebrate the beginning of life and new beginnings. 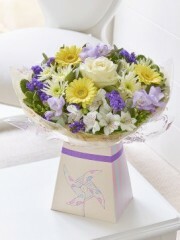 Four Seasons Florist Edinburgh ensures that with our gifts and flowers every mother can feel at ease and looked after by her friends and family, knowing that she and her new born baby are in safe hands.